I have had some plans to realise 6BR wildcat. I'll drive 6BR reamer 7mm deeper to achieve 46mm lenght for case. 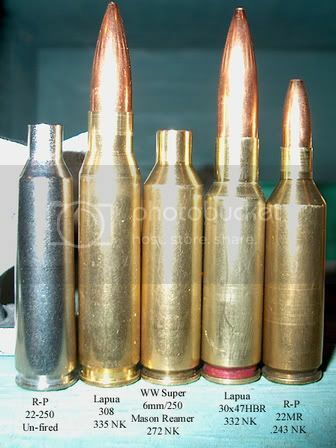 Cases supposed to be shortened from 308 brass. Do you have any experience of such a wildcat over there? Target for caliber is to achieve a little more fps for heavy 6mm bullets compared to my recent 6BR. There is .243AI wich would do the work but I won't go for it due to the disadvantages created by too much case capasity. Lapua will be releasing a new case very soon, called the 6.5x47 Lapua, which will be like a long 6BR. Necked-down to 6mm, it should be just what you want, with no case-forming required. Call the factory in Lapua, Finland and ask for Tommi Tuuri or Janne Pohjoispää. They are on the design team. Thanks for reply. I've heard of that new cartridge. I think it will be out of reach for me little more time because a smith should have a reamer and I should have dies for it. I have 6BR dies and the smith has 6BR reamer already which makes that wildcat i explained reasonable. Anyway for now i'm going to be patient and wait for the announcement of new Lapua 6x47. Is it likely that the new 6.5 x 47 Lapua with 123/130 gr. bullets would work at 1k benchrest as is? I assume it will not have enough case capacity but wondered what others thought. If not I will probably rechamber my light gun (6br) to 6 x 47 in this case. Would keep the 30 degree shoulder. Love my 6BR but not the greatest in the wind at 1k. Samuli, I have a 22BR with a .243 NK run in .300" deeper, called a 22MR, (7th from left) which is a 22x45.7708mm. A friend used a 6x46 in Hunter Bench Rest using 308 brass (9th from left). He said it shoot pretty good but moved to a 30 for the hole size (score comp). I'm making a new rig on the 6mm/250 Mason (13th from left) which is a tad bigger than a 6XC, both of which you can think of as a 6x48 + a hair. I also use a 30x47 in HBR(10th from left), necked down to 6mm it would be plenty of zip too. 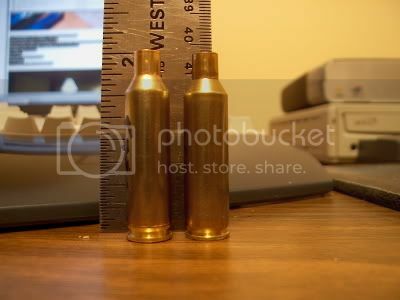 I would go more like 8 or 9mm deeper(6x47 or 6x48) if you want the extra zip using the heavier bullets, IMO. Just how much more case capacity than the 6XC does you 6/250 Mason have? From the picture it appears to have a little shorter neck, but I can not make out whether it has a larger diameter shoulder/less case taper. You are right, the 6mm/250 has a shorter neck than the 6XC but a little longer wider body and holds 1.4g more water. A full 308 has 56g case cap and my 30x47 has 49.49g case cap made from Lapua 308 brass. The 6mm/250 has a .469" base and a .466" body base above the extractor grove and a .455" body at the neck/shoulder area. The 6XC has a .468" base and a .466" body base above the extractor grove and a .450" body at the neck/shoulder area. Both have the same shoulder angle as a 6BR, 30 degree. Thus, the 6mm/260 has less tapper than the 6XC, i.e., more blown out, and is a hair longer in the body, so the case cap. is a little more than the 6XC.